More practice highlights. This time, set to a face-melting guitar solo. I'm not going to break down this as much as the other videos we've seen out of spring practice this year. Mainly because this is all field-level camera angles and it's too difficult to really gauge what's going on. Denard throws the ball, a receiver catches it. Denard get the ball knocked out of his hand...because he carries it like a loaf of bread...and then picks it up and runs for a million points. I will say that the more I see Denard and Devin throwing back-to-back in these highlight videos, the more I think Devin has the far superior arm. I mean like it's not even close. Denard can get the ball to it's target...or close enough to it...most of the time. But Devin slings the ball around like he means it, and the passes all seem to be spot on. Just a random observation. We'll see much more this Saturday. 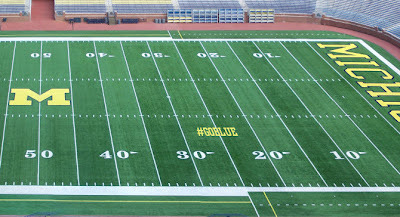 ANN ARBOR – The University of Michigan Athletic Department will paint the FieldTurf at Michigan Stadium with the hash tag, #GOBLUE, for the upcoming Mott Spring Game presented by PNC Bank. The Wolverines will use the opportunity to generate exposure inside the stadium, on the nationally-televised broadcast and most importantly in the social media world. 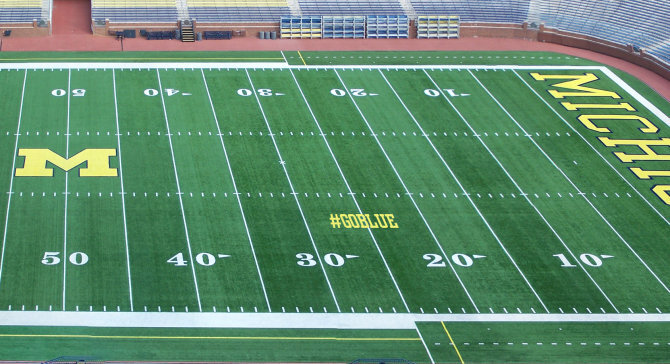 The annual spring football scrimmage and the “Battle at the Big House” men’s lacrosse game against Ohio State will be held on Saturday, April 14, at Michigan Stadium. The Victors Classic Alumni Flag football game begins at 10 a.m., followed by the annual spring football scrimmage at noon. The lacrosse game is tentatively slated to start at 2:30 p.m. The hashtag “#GOBLUE” will be painted maize at two locations. The hashtag will straddle the 25-yard line on the northeast and southwest sides of the field. Hit the link above for all the gooey details. Not sure exactly how this is going to go over, but it seems like it's a spring game only thing – which is fine I suppose. I love watching football games as well. In fact, when I was in college, I always watched live games in my school. I can still remember the times when those players rolled over on the synthetic grass just to get that ball. It was an exciting but strenuous game.